Soviet frontline propaganda banner directed towards Finns, 1942. 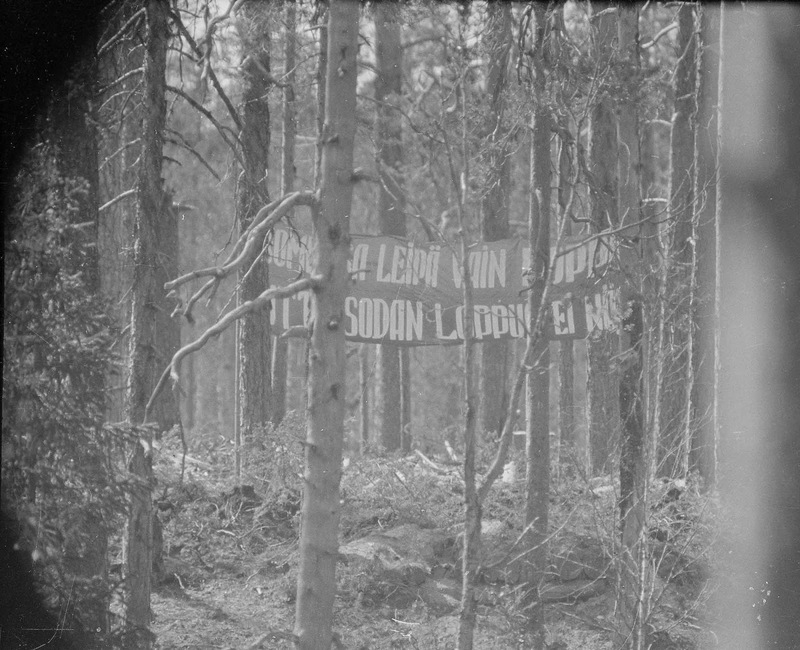 This is a Soviet propaganda banner on the frontline in Uhtua, Northern Karelia. It reads: “Finland is out of bread, but the war is not over yet”. 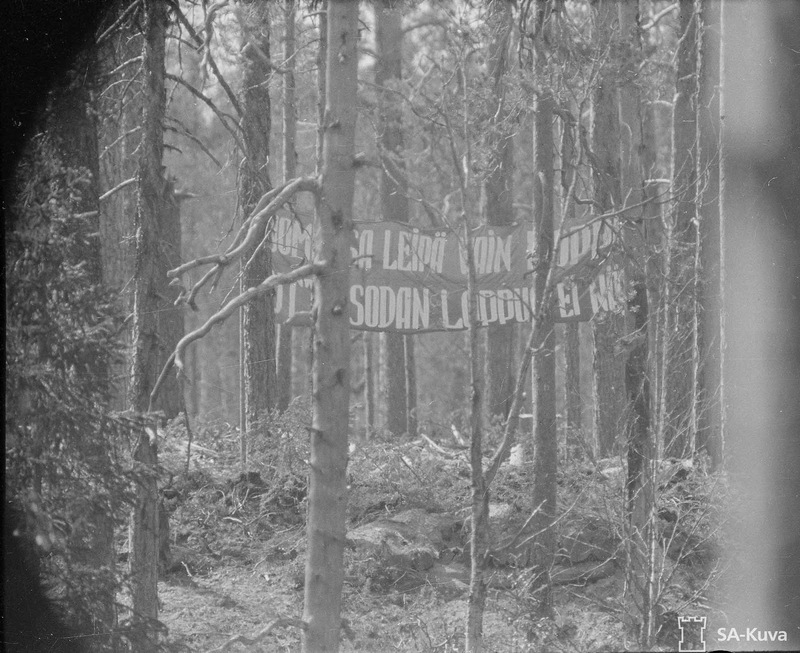 The long-distance photo was taken on June when the Finnish-Soviet front had stabilized for the most part into trench warfare. Soviet propaganda against Finland saw a significant difference between the Winter War (1939-1940) and the Continuation War (1941-1944). During the Winter War Soviet propaganda centered around the notion of liberating the Finnish people from pro-German bourgeoisie and capitalist oppression. During the Continuation War Finns were invaders in the leash of Hitler. Propaganda became more aggressive, taunting and defamatory. Soviet propaganda didn’t try to convince Finns of communist ideals and liberty, but rather that Finnish soldiers should desert while they can before the Red Army inevitably destroys them. Acts of war between the Soviet Union and Finland recommenced on 22 June 1941, the day Germany launched its invasion of the Soviet Union, with covert Finnish operations. Open warfare began with a Soviet air offensive on 25 June. Subsequent Finnish operations undid its post-Winter War concessions to the Soviet Union on the Karelian Isthmus and Ladoga Karelia, and captured East Karelia by September 1941. On the Karelian Isthmus, the Finns halted their offensive 30 km from Leningrad, at the pre-World War II border between the Soviet Union and Finland. Finnish forces did not participate in the siege of Leningrad directly, holding their pre-World War II territory on the Karelian Isthmus for two and a half years instead. In 1944, Soviet air forces conducted air raids on Helsinki and other major Finnish cities. Eventually, in mid-1944, the Soviet strategic offensive drove the Finns from most of the territories they had gained during the war, but the Finnish Army later brought the offensive to a standstill in July 1944. A ceasefire ended hostilities on 5 September and was followed by the Moscow Armistice on 19 September. “Finland is out of bread, but the war is not over yet”.